Evelyn De Morgan (1855–1919), Cadmus and Harmonia (1877), oil, dimensions not known, The De Morgan Collection, England. Wikimedia Commons. With the disposal of Athamas, Ino, and their children, the house of Cadmus, founder-king of Thebes, is finished. Ovid rounds it off with a short but touching myth which sees an end to Cadmus’ dynasty. It is worth noting that, although Ovid names Cadmus’ wife as Harmonia, in other sources she is Hermione, and is frequently referred to as that during and after the Renaissance. he saw and felt himself increase in length. and gradually tapered as a serpent’s tail. Just before his upper body and head are transformed into the snake, and still with tears streaming down his cheeks, he embraces his wife one last time. As his transformation completes, and Harmonia finds herself wrapped in his coils, she calls on the gods to transform her too. And they do. To the amazement of those around, the two snakes slither off into a nearby wood. Having been good people, they are neither venomous nor do they bite. So ends the house of Cadmus. Perhaps uniquely among the many substantial myths in Ovid’s Metamorphoses, there appears to be just one painting in the history of Western art which tells this story, despite its very visual nature. 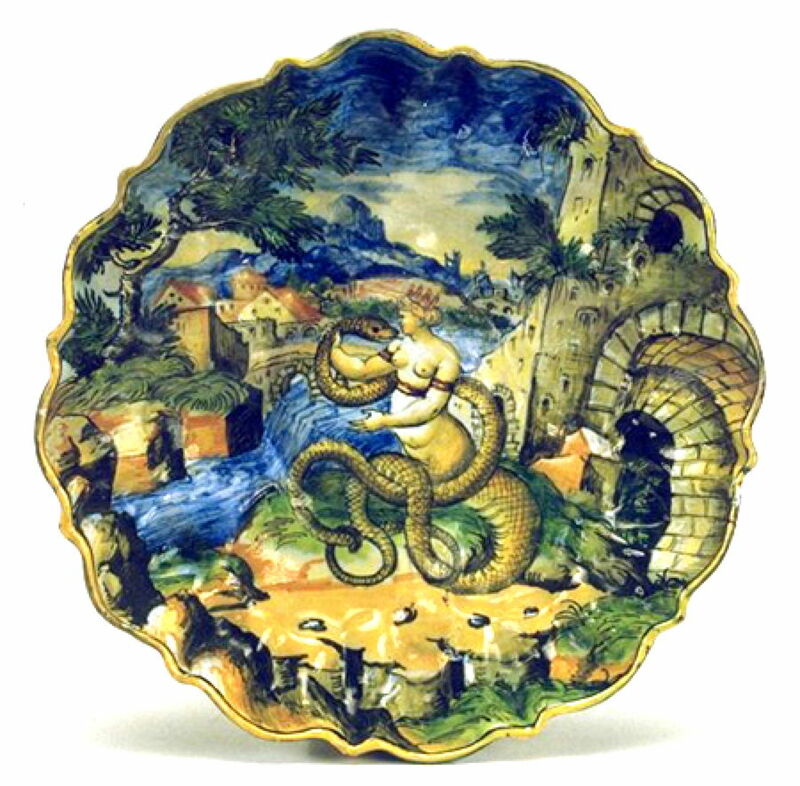 However, several drawings and prints have been made of it, and I start with a fine item of Faenza maiolica. Virgiliotto Calamelli (1531-1570), Cadmus and Harmonia (c 1560), Faenza maiolica ceramic, dimensions not known, Museo Internazionale delle Ceramiche, Faenza, Italy. Wikimedia Commons. Virgiliotto Calamelli’s ceramic telling of Cadmus and Harmonia from around 1560 is a brilliant depiction of Ovid’s story. He chooses a later moment, in which Cadmus’ transformation is complete, and Harmonia’s has reached her abdomen. Crispijn van de Passe the Elder (1589-1637), Cadmus and Harmonia Changed into Snakes (1602-07), engraving, 8.4 x 13.2 cm, Rijksmuseum, Amsterdam. Courtesy of The Rijksmuseum. 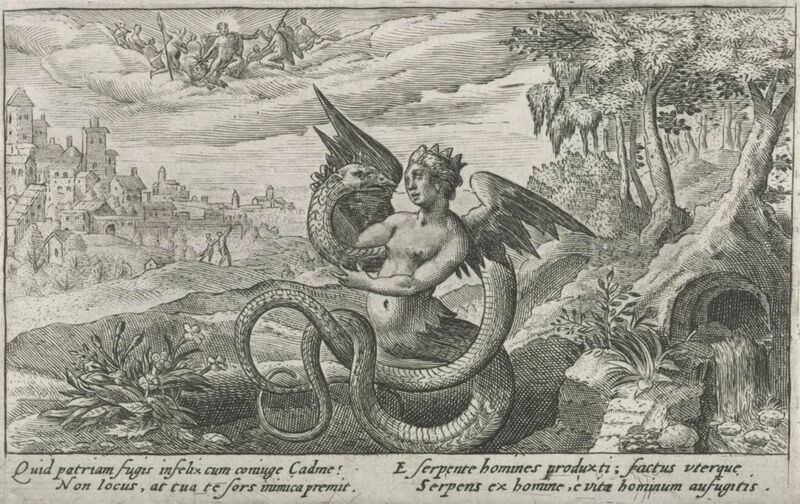 I’m not sure where Crispijn van de Passe the Elder sourced his engraving of Cadmus and Harmonia Changed into Snakes (1602-07), but it is essentially the same as Calamelli’s plate. The town on the left is a bit more extensive, and the gods have been added in the clouds above, but even the intertwined coils of snake are a perfect match. For over two centuries, the story vanished without trace from the visual arts, before it was revived and revisualised by Evelyn De Morgan. Entwined her neck, and shared the loved embrace. De Morgan was certainly very familiar with classical myths, which were a frequent source for her paintings. She was influenced by Edward Burne-Jones, taught by her uncle John Roddam Spencer Stanhope, and at the Slade by Sir Edward Poynter: all three had extensive knowledge of classical myths, and Poynter’s was deep to the point of being quite esoteric. It has been suggested that Harmonia is here reminiscent of Botticelli’s Venus, a painting which De Morgan knew well, as she had copied it when she was a student. She certainly doesn’t seem to have been influenced by any earlier image of the story, but her Harmonia is certainly not the older woman that Ovid describes. Evelyn De Morgan’s painting may be one of a kind, but does the job perfectly. Posted in General, Language, Life, Painting and tagged Cadmus, De Morgan, Harmonia, Metamorphoses, myth, narrative, Ovid, painting. Bookmark the permalink. These articles are great! I’ve been reading a little Ovid in the morning before work. These are great supplements. I greatly enjoyed writing these, although it was quite a marathon task.